In one TV commercial from this year’s Toys R Us holiday campaign, a mother sweats through her cycling workout while her suspiciously helpful daughter tries to stir up a breeze. “I’m just going to leave this right here,” the girl says, covering the stationary bike’s display with her impromptu fan — an old-school mail-order catalog. In a time of explosive growth for online buying, retailers and shoppers are showing renewed interest in a humble purchasing device that uses paper instead of pixels. For the first time since 2011, Sears Holdings sent out the Sears Wish Book, a holiday tradition for generations of children. Although this year’s catalog has the heft of a magazine rather than the phone-book size the department-store chain produced when it was a retail juggernaut, the offerings are more extensive and searchable online. Neiman Marcus Group, in the 2017 edition of its venerable Christmas Book, used a social-media contest for 1,500 photos capturing happy moments to be featured in a cover collage. And home furnishings retailer Wayfair.com started mailing full-line catalogs last year. Lauren von Bernuth, a Los Angeles boxing trainer, said the Sears and Neiman Marcus catalogs bring back pleasant memories of looking through them. Fewer catalogs are in the mail these days, 9.8 billion in 2016 compared with the 2007 peak of 19.6 billion, but consumers are paying more attention to them than ever, according to research by the Data and Marketing Association and the U.S. Postal Service. In 2016, the response to catalogs increased 23 percent from the year before, O’Keefe said. Companies are using print catalogs to cut through email clutter and social media saturation, said Denise Lee Yohn, a retail brands expert. The catalogs help “differentiate brands and sustain existing customer relationships,” she said. That works for Natalie Montoya Farrow, who likes to relax with a glass of wine and the Anthropologie catalog of clothing and decor. Social media has made her “hyper-aware of everything, so it’s nice to sit and fantasize with a catalog,” she said. Yohn said catalogs won’t help all struggling brands. O’Keefe said print catalogs will never be as popular as they once were, but retailers appear to be using them as part of what he called an “omnichannel” approach that tries to more closely integrate a store’s website with its physical stores, such as buying online and picking up at the store the same day. A survey included in a recent DMA report found that nearly one-third of those polled said getting a catalog drove them to shop online. Sears was looking for some of that success when it brought back its Wish Book. Neiman Marcus executives felt the catalog deserved something extra in the company’s 110th year, said Theresa Palermo, vice president of brand marketing and public relations for Neiman Marcus Group. But the response was much bigger than expected when the retailer ran a contest for a chance to get a tiny photo on the Christmas Book’s cover. For 1,500 spots, the company received submissions from 17,000 people. It’s plenty hard for a battle-tested publisher to launch a print magazine these days. Nevertheless, a bold (or delusional) company that’s in a retail business will occasionally think, “Hey, we can do that!” — and so chooses, against great odds, to dive into the magazine fray. It seems crazy, counterintuitive, and financially irresponsible, right? But it does not foreclose the possibility that these outfits can actually put out interesting books. Cash and smart hiring can go a long way. As to why they’d want to get into something as last-century as ink-on-paper mags — well, one word: “Brooklyn.” Meaning there’s always a place and a time for throwbacks (craft beer and artisanal bread, anyone? ), even if it turns out to be ephemeral. The two non-publishers that recently decided they could do magazines as well as anyone have already produced Vol. 1, No. 1 of their fresh-from-the-ground-up titles, and each is pretty decent in its own right. Will they succeed in any meaningful way? Will they ever pay for themselves? Who’s to know — though the odds are way long. If there’s anything you can reliably say about the magazine business, it’s that unbridled optimism has always been a powerful aphrodisiac. 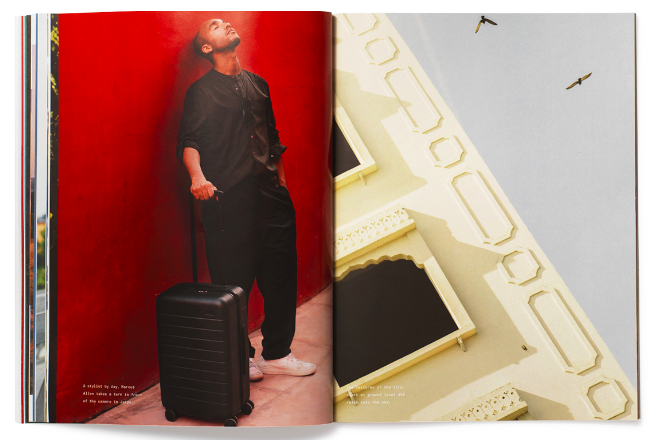 First out of the gate with its new magazine was Away Travel, a company that designs and markets luggage targeted at millennials who like to do their shopping online. Its quarterly book, Here, is getting ready to drop a second issue in the weeks ahead. More recently, Hodinkee, which operates a popular website that focuses on — and sells — high-end wristwatches and related merchandise, published the inaugural issue of Hodinkee magazine, a bi-annual. Both Here and Hodinkee are, broadly speaking, lifestyle magazines, but that’s about all they have in common — other than the fact they are bankrolled by companies that have no previous experience in publishing. In order to be taken seriously, both magazines needed to understand from the get-go that if they looked or read anything like product catalogs, they’d have wasted every last penny of the launch budget. In each instance, the editorial mission, best as I can tell, is to subtly embellish a brand that is not yet very well known (except to some enthusiasts). Let’s be honest: this is not an easy thing to accomplish. I’ll begin with Here. Its editor, Ally Betker, joined Away Travel a year ago, directly from W magazine. She went all-out for the job when it was posted. “I came to my second interview with a full editorial plan,” she told me when we spoke a while ago. In that, Betker and her team have largely succeeded. You’d be hard-pressed to make a connection between the magazine and the merchandise its publisher sells. There are several incidental pictures of Away luggage scattered about the heavily visual first issue, but they aren’t even acknowledged in the captions. Just pieces of luggage in their natural environment. Nice. Mostly, what Betker has produced is exactly what she had in mind when she scored the job: a nifty little travel magazine for millennials of a certain sensibility. “We wanted it to have a vintage travel-book sensibility,” Betker told me. And indeed it does. Seems like its readers might want to stuff the 84-page magazine into their backpacks, along with their herbal teas and wine-tasting notebooks. Here is nothing if not rugged and informal in presentation. Most of it is printed on an off-white, uncoated stock (“We spent a lot of time feeling and smelling paper” Betker said), the layouts are airy, the fonts anything but trendy. Several story choices are delightfully unconventional. For example, what other travel book would run a piece about the best “stealable stuff” at five major hotels, two of which are in the United States? OK, but how is Here significantly different from all those well-funded magazines in the competitive travel category? The first issue of Here features a lively mix of stories (the actress Rashida Jones hanging in Stockholm is the cover piece), some of which I think could easily have found their way into the competitive titles, but the POV is youthful, without question. It’s reflected in the art and the attitude. Nothing here suggests five-star travel. And that’s largely the point. Readers of Here are more likely to be booking trains and Airbnbs — a decidedly more youthful style of venturing around the globe. That style ostensibly suits the parent company, which of course knows there is no immediate pay-off to be realized in this experiment. Away Travel has budgeted for four issues. It’s hired a staff. The book is selling ads. (Cathay Pacific took cover 3; cover 4 is blank.) So, what’s in it for Away? Hard to know. Anyone who purchases a piece of Away luggage will find a copy of Here inside, which is cool. However, the book carries a $10 cover price, and the intention is to get it onto newsstands or to subscribers at some point. It’s not really just a piece of “Welcome to the Away brand” literature. Betker, the magazine’s editor, told me Here was funded because it is “intended to fit in with the Away ethos.” As to how the company itself describes that ethos, I have no way of knowing. Repeated efforts to talk to a company executive went unanswered. Now, to Hodinkee. It is entering a space where, like Here, there would appear to be more than ample competition. I have written about high-end timepiece magazines before. It’s more than likely that several are struggling, just as the luxury watch industry is known to be struggling these days. Moreover, it’s got to be noted that watch enthusiasts are accustomed to seeing the beautifully produced catalogs — some hardbound — that are routinely distributed by top-line watch manufacturers. How to fit into the mix? Well, first of all, you go ultra-luxe, furthering your claim on an audience of enthusiasts who buy watches in the six figures without so much as a blink. The initial 160-page issue of Hodinkee was introduced with a cover price of $27. (Five hundred copies of a deluxe-bound edition were made available pre-publication.) Given the production quality, that’s not an unfair number. That would explain why a magazine for watch enthusiasts would devote 12 pages to the joys of owning a Porsche 911. Or nearly as many pages to the pleasures of Paris. (Might Here magazine have run a similar piece about Paris? No. And that’s the point. Hodinkee’s perspective is notably different. It is aimed at wealthier, older (and possibly more discerning — or is that “elitist?”) consumers. What further sets Hodinkee apart from other magazines about watches is the quality of its writing and its general intelligence. There is very little gee-whiz here. No backflips over remarkable new movements or materials. Serious connoisseurs will presumably appreciate the approach. Where Hodinkee slips a bit is in its sponsored edit. For example, Grand Seiko uses three spreads to show off a few of its timepieces. Hodinkee clearly ID’s these as a “Partnership” arrangement. Readers are unlikely to take offense, as the edit is visually indistinguishable from everything else in the magazine. Still, sponsored edit is basically advertising, and I wish the practice could be avoided. The folks who created and have nurtured the Hodinkee brand — the website, the exclusive timepieces, the special events — are doing a remarkable job of serving an exclusive demographic. Their audience, which has grown swiftly, is now global. In bringing out a perfect-bound magazine — each issue to be a keeper, for sure — the company is further tapping into the wealth of these customers. It’s difficult to imagine that the magazine will, on its own, pay for itself. Nevertheless, the connection between the book and the overall corporate mission seems clearly aligned: consistency of high-end branding is everything to the kind of folks who would travel to Europe to touch, and maybe buy, a couple of watches for a hundred grand apiece. Hodinkee magazine, if you see it as a well-thought-out piece of company marketing, might thus be worth the investment.